Remaking Child's Play? For MGM, that's, well, child's play. According to The Hollywood Reporter, MGM has put into a development a remake of Child's Play, the 1988 horror classic directed by Tom Holland (not that Tom Holland, of course). The studio tapped Polaroid filmmaker Lars Klevberg to direct the remake, with Kung Fury scribe and seasoned video game writer Tyler Burton Smith attached to pen the script. David Katzenberg and Seth Grahame-Smith will produce the new Child's Play — a solid sign considering they were the producers behind director Andy Muschietti's horror smash It. Kung Fury 2 producer Aaron Schmidt is on board as executive producer. The original Child's Play, co-created by Don Mancini, centered around a possessed "Good Guy" doll named Chucky, who torments a single mother and her son, who later learn that the red-haired doll holds the soul of the infamous serial killer Charles Lee "Chucky" Ray, played by Brad Dourif. The murderer transferred his soul into the doll using a Haitian Vodou spell as a way to cheat death after homicide detective Mike Norris fatally shot him. Alex Vincent portrayed Andy Barclay, the 6-year-old boy whose body Chucky wants to enter in order to make his human-to-doll transference permanent. Catherine Hicks played Andy's mother, Karen Barclay. Child's Play spawned a long-running film series that started with the sequel Child's Play 2 in 1990 and most recently released Cult of Chucky in 2017. Throughout the franchise, Chucky even got married (in 1998's Bride of Chucky) and had children (in 2004's Seed of Chucky) — because why the heck not, right? 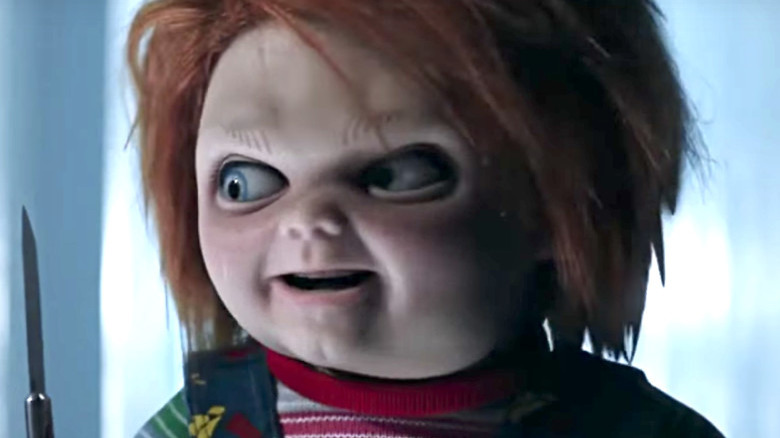 News of a Child's Play remake comes after it was announced that original screenwriter Don Mancini and producer David Kirschner were teaming up to develop a television series based around Chucky. Brad Dourif, the OG voice of Chucky, is also attached to the project, set to lend his pipes to the demon doll once more. The eight-part show isn't a reboot, however, as Mancini explained to Bloody Disgusting, and will explore the (even) darker sides of Chucky's history as opposed to getting down and dirty with social commentary and humor. The end of 2013's Cult of Chucky, in which the tiny titular killer murdered his way out of a psychiatric hospital, "deliberately set up" what will happen in the Child's Play series. "We plan to use Child's Play in the title," Mancini previously stated. "We want to definitely signal that we are going dark, darker than ever before. It's going to be very creepy. I'm incredibly excited about the series and to explore a world in which we've never done before." It's unclear how MGM's Child's Play film will differ from Mancini and Kirschner's Child's Play series, but Collider speculates that Dourif won't be involved in the movie and that the studio will recast the voice of Chucky. Though MGM didn't provide comment on the news, THR notes that the studio is "fast-tracking the project." Production is slated to begin this September, with filming taking place in Vancouver, British Columbia, Canada.